Apex Knitwear Co. Inc. were located at 35 E. 12th St. from 1924 to 1929. They struggled through the first few years of the Great Depression at 25 W. 32nd St., then went out of business. The sign indicates they manufactured men's and boys' sweaters and bathing suits. Proprietor in the early 1930s was Harry Scharfman (1891-1960). U. S. Census reports indicate that he was born in Romania and immigrated in 1894. In 1900 Harry Scharfman, age 8, lived with his father, mother and four siblings at 408 East 6th St., Manhattan. In 1930 Scharfman lived at 189 E. 39th St., Brooklyn, with his wife, Eva, daughter, Hilda, age 14, and son, Irving, 10. 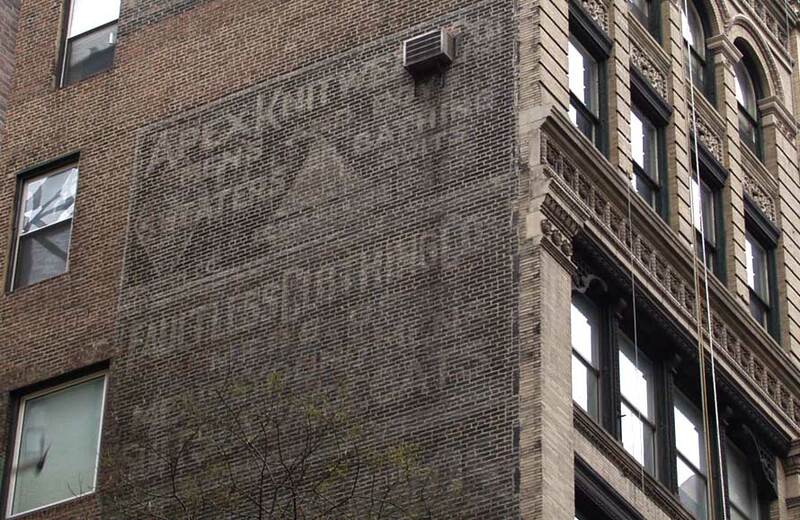 The sign for Faultless Clothing Co. seems to read, "Mfrs of Men's & Young Men's Suits [something] Coats." Directory listings don't give a great deal more information, only that the business was located here from 1921 to 1929. Their founding was announced in Clothing Trade Journal, Vol. 19, No. 4, July 1921, p. 172: "The Faultless Clothing Co., of New York is a new firm established at 35 East 12th Street for the manufacture of men's clothing." Proprietors in 1925 were Max Burnofsky (1890-1970) and Max Abrams. Max Burnofsky registered for the World War I draft in 1917 when he declared that he was born 24 March 1890 in Grodno, Russia and that his occupation of the time was Expressman. He seems to have immigrated to the U. S. around 1900, and can be found in the U. S. Census of 1910 living with his father, Philip Burnofsky, proprietor of a stable. The family lived at 414 East Houston St., Manhattan. Max and his older brother, Peter, gave their occupations as Expressman. By 1920 Max Burnofsky had a wife and 2 children and lived in Brooklyn, but his occupation remained Propietor Express Co. Not until the 1930 census does Max Burnofsky identify himself as "Manufacturer Men's Clothing." By the time of his registration for the World War II draft in 1942, Max Burnofsky had changed his name to Max Baron. This document also gives the address for Faultless Clothing Co. as "206 S. Polaski St., Baltimore, MD." Apparently there was a Baltimore branch at this time, when the Manhattan telephone directory continued to list Faultless at 200 5th Ave. (through 1949).